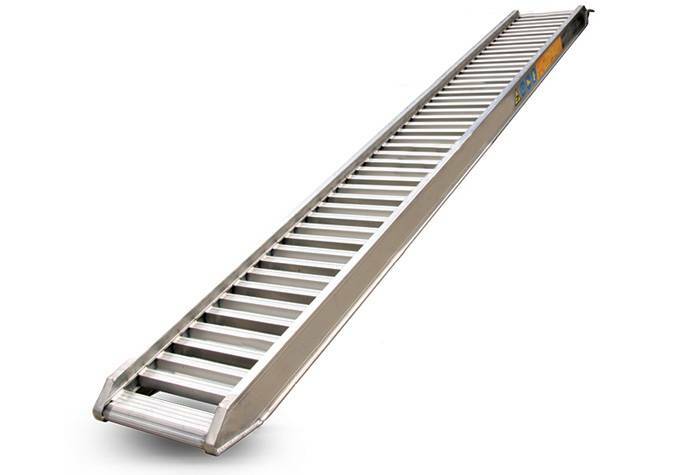 A light weight loading ramp with enhanced safety that delivers on quality, performance, and is cost effective. European designed and engineered, the new Digga Ezi-Loada ramps feature the most advanced design in the Australian market today. Digga’s new aluminium loading ramps include a standard range (1t to 6.2t) and a Universal range (5.2t to 9t). Pin: Inserted through the ramp tray. Tongue: Fits between truck bed and tail gate. Chain: Chain ramp to truck or other structure. Our ramps have been certified to the highest international standards includig CE, GS, and TUV certifications. These certifications guarantee the quality and safety of the ramps. Patented, fully extruded, double T-beam design, interlocks the rungs into the body of the rail. No physical load is taken by the weld alone. The welds (top & bottom), hold the rung in its fitted position, adding superior strength & durability. Reinforced, easy load, lead on/off design are safer and more durable than conventional ramp designs. The reinforced bottom rung sits low to the ground ensuring machines don’t have to ‘step up’ onto the ramp. As a result the bottom few rungs won’t bend, as so often is the case with current ramp designs. The ride is also much smoother. For pricing or more information about the Aluminium Loading Ramps fill out the form and we&apos;ll be in touch soon. Alternatively call (08) 9457 1544.